Yair Rodriguez had a rollercoaster of a year. After taking a sickening beating at the hands of Frankie Edgar in May of 2017, he spent some time on the shelf. Then in mid 2018 he was shockingly released for refusing to fight, as rumours of his matching up with Zabit Magomedsharipov floated around the internet. After much uproar he was reinstated, and subsequently booked against Zabit in a highly anticipated prospect vs prospect clash. Unfortunately, injury curtailed those plans, and Yair now found himself at the bottom of the UFC totem pole. The injury bug would strike another down, however, removing Frankie Edgar from his fight with the Korean Zombie. Yair stepped in, to the surprise and delight of many an MMA fan. Zombie, himself in a rebuilding process after a stint in the Korean military is a man known for producing bangers, and Yair is as exciting a striker as they come. They lived up to the hype and then some, creating violent magic on the date of the UFC’s 25th anniversary. 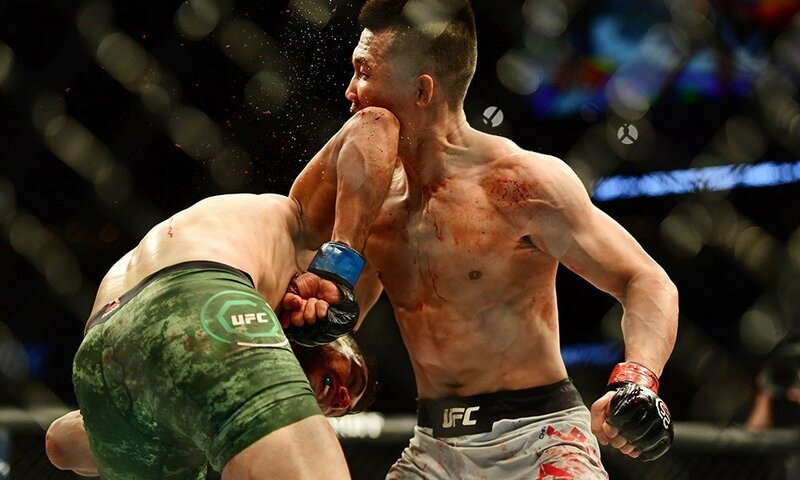 Yair was losing the fight on the scorecards, before throwing a hail mary no look backwards elbow thing at a charging Zombie in the literal final second of the fight, flatlining him. Yair Rodriguez started the year practically forgotten by fans and publicly trashed by Dana White, spent the middle of it unemployed, and ends it being lauded for what many are now considering the greatest knockout in the history of MMA. A lot can happen in a few months. A controversial one, with as many supporters for DJ as for Cejudo. Whatever you thought of the decision here it’s impossible to deny the gravity of this title change. 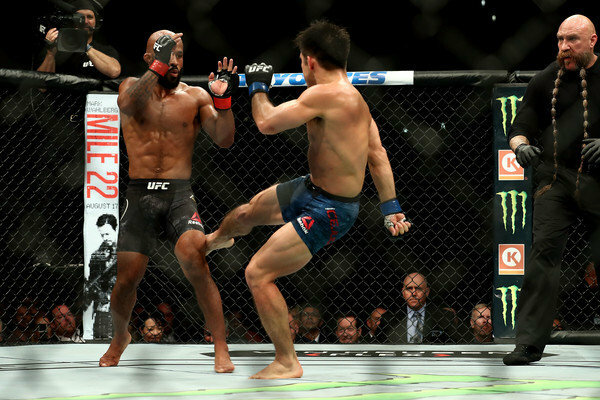 After breaking Anderson Silva’s all time title defense record in 2017 and dominating everyone put in front of him, “Mighty Mouse” was a downright institution in the eyes of MMA hardcores. As such Cejudo was considered a simple diversion on the way to a super fight for the unbeatable Johnson. The Olympic gold medallist had other plans. In hindsight the fight wasn’t that exciting, and I suspect watching it knowing the result would yield disappointment. But Demetrious Johnson was considered an unsolvable solution, and while Cejudo wasn’t dominating, he was doing better than anyone thought not only he but anyone else could do against the then only flyweight champion in UFC history. It was a thrilling sensation and after the 25 minutes were up for the first time in a long people weren’t sure if Demetrious Johnson was leaving with a belt. Cejudo got the nod, and era came to an end. Hindsight will not be able to adequately assess the excitement of this moment. After a year away from the cage for the young featherweight king Max Holloway, he met jiu jitsu wunderkind Brian Ortega at UFC 231 in Toronto. Holloway had been booked for three fights since his second defeat of Jose Aldo in December of 2017, being deemed medically unfit at the last minute each time. The third occasion saw a cancelled title fight with Ortega back in July, due to Max exhibiting concussion like symptoms during fight week. When it comes to the brain, people tend to worry, and were even beginning to question Holloway’s speech. Despite doubt by many, Max Holloway finally made it to the cage at 231 and put an unholy beating on the undefeated Brian Ortega. After over a year on the shelf, “Blessed” looked better than ever. 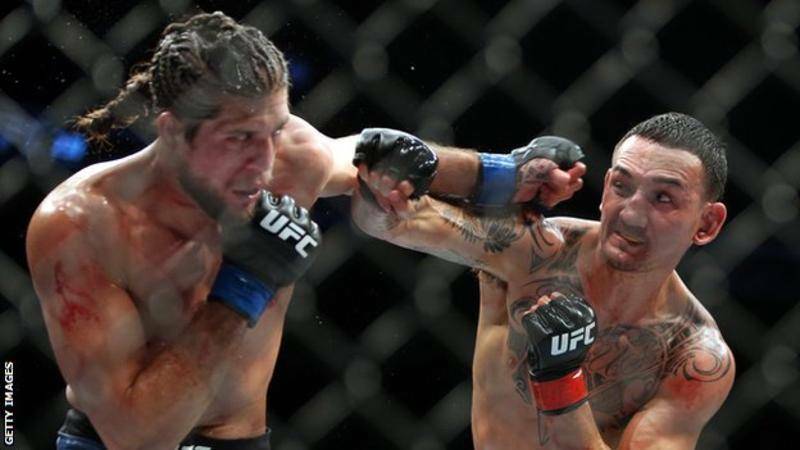 Dealing with depression and the belief that he many never fight again, Holloway’s return proved many people wrong, and he looks to extend that thirteen fight winning streak in 2019. This was the biggest fight in the history MMA, so it goes without saying this was important. The thing with this one though, the story surrounding the fight got ugly quickly. Words exchanged between the two men were deeply personal and stirred up so much emotion that we are still dealing with the consequences of Khabib’s post-fight freak out and the ensuing brawl. The fight itself however, was an exercise in anxiety for fans. The bout had an air of importance and personal stakes unlike anything in recent memory, as whoever won was essentially the “man” in the sport, and for its duration the tension was almost unbearable. As both men are known to be quick to implement a decisive gameplan, I can honestly tell you I’ve never been so nervous for something I wasn’t directly involved in. The fight was fascinating, with most of it spent on the ground with Khabib’s relentless top game taking hold. Due to the hyper focus on defending takedowns the McGregor, Khabib was even able to land a clean overhand right, knocking the Irish striking savant down. Round three did actually stay on the feet, leading to some hope for McGregor. It was not to be however, as Nurmagomedov was able to get the RNC finish on a worn down McGregor in the 4th, and then what happened happened. I really hope we don’t see a rematch for the simple reason that I don’t know if my heart can take it. In the eyes of many, Tony Ferguson is uncrowned king of the lightweight division. Winning the interim belt during Conor McGregor’s hiatus in October of 2017 and extending his winning streak to 10, the only logical fight was between him and Khabib. The fight was booked for March of 2018, then Tony tripped on a cable and ripped his knee apart, making this the fourth time Tony vs Khabib has been cancelled. 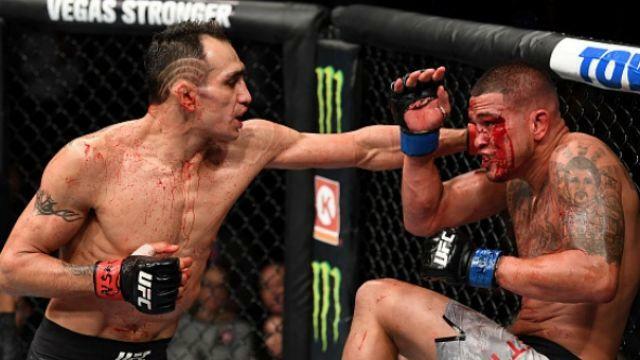 After a truncated rehabilitation that saw “El Cucuy” take his recovery into his own hands, he returned at UFC 229, the biggest event in the history of MMA. His opponent, Anthony Pettis, himself a former lightweight champion was enjoying somewhat of a career resurgence and it was all to play for in Vegas. What followed was two rounds of bedlam, with both men covered in blood. Unfortunately Pettis couldn’t make it out for the third due to a hand injury, giving Ferguson 11 straight in the octagon. He was back, ready to take on the winner of the main event, and Pettis got to prove he still had that warrior spirit. The consensus fight of the year and for good reason, Whittaker vs Romero 2 played out like a live action Dragon Ball Z fight. 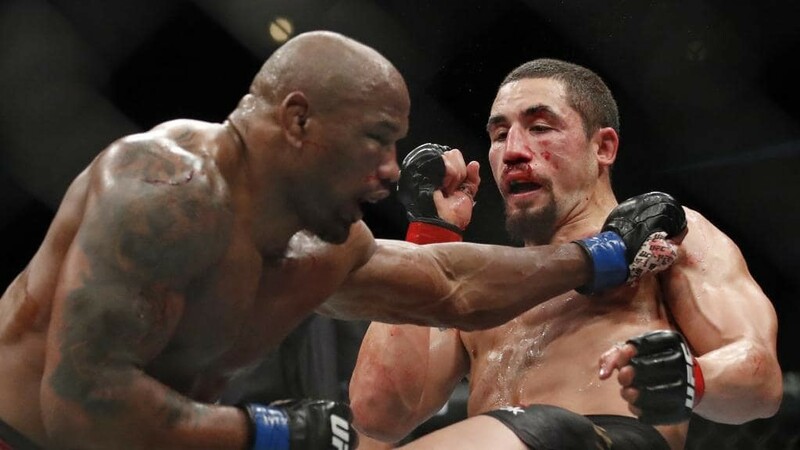 The seemingly superhuman Yoel Romero hit the incumbent champion Whittaker with bombs, dropping him repeatedly and sustaining minimal damage himself. In a post fight testimonial, Whittaker said Romero “felt like concrete”. That showed. Bobby Knuckles however, did what champions do, enduring in the face of inhuman punishment. Whittaker stuck to the gameplan in the intervening moments when he wasn’t being lit on fire and outpointed the Cuban aberration to a controversial decision victory. Whoever you scored the fight for, you have to admire both men. The 41 year old Romero for retooling his game in the 12 months since their last fight, and the champion Whittaker for flat out refusing to lose this fight. The real drama played out before the fight proper however. Romero, being an actual cartoon muscle man, failed to make weight for this title fight in Chicago, coming in at 186 lbs. Practically collapsing off the scale, he was given an extra two hours to make the championship weight. Unsettling considering the state he was in. In what was most likely a panicked decision on the part of the commission, they decided to cut those two hours short, and Romero weighed in before he was ready. He came in at 185.2, just missing the 185 limit, meaning this was to be a non-title fight. With this in mind the fight itself became a tragedy of sorts. No matter the effort put in by Romero, he was not going to be given a belt that night in Illinois. Then these fighters went out there and did that, with nothing but pride on the line. An illuminating 25 minutes to say the least. As we head into the 2019 this violent comic book/soap opera will continue. There was plenty of great fights in 2018 that were not included here, as I’m sure there will be plenty of great fights this year that few people see and even less people talk about. That’s the fight game; it’s weird, tragic, funny, sad but most importantly it’s hopeful. Here’s to a good year, and more great stories to tell. Images courtesy of dailytelegraph.com.au, news.com.au, bbc.co.uk, zimbio.com, mmajunkie.com, lowkickmma.com, sportsjoe.ie.